The delightful setting and facilities of Felpham Sailing Club’s clubhouse make it an ideal venue for events such as family parties, business workshops, coffee mornings and club meetings. 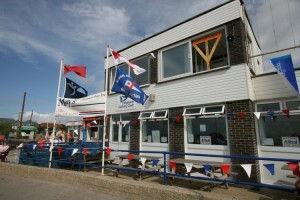 The club is available daily (with or without bar facilities) outside of club sailing times and events as per the club programme. Please get in contact to discuss your requirements. If hiring the club to include bar facilities we offer a fully stocked bar with beers, wines, spirits and soft drinks available at excellent prices. All drinks consumed on the premises must be purchased from the bar. Discounted rates are available to club members hiring for personal use. Note that when hiring the club the use of the upstairs area (including balcony), kitchen and showers is not included. Further conditions are given on the hire form. Please note that the club is not available for teenage parties and has a strict no smoking policy. If you wish to find out more about club hire please do not hesitate to come along to the club and talk to the steward or a committee member or get in touch via email. The hire form is currently being updated for 2018 – the prices given in the file available below are not accurate. Please note that all club bookings should be arranged via Bill Brooks ([email protected]). Completed forms and cheques must be marked for the attention of Bill Brooks.